The battlefields of World War II were not on the mainland of the United States, that does not mean that there is nothing to be found about this war. The United States has actively participated in the Second World War and memories about this can be found on several locations. Many of these locations have been documented on the website tracesofwar.com. Who’s looking for Second World War memories within the United States, certainly cannot miss Washington and the adjacent city of Arlington. 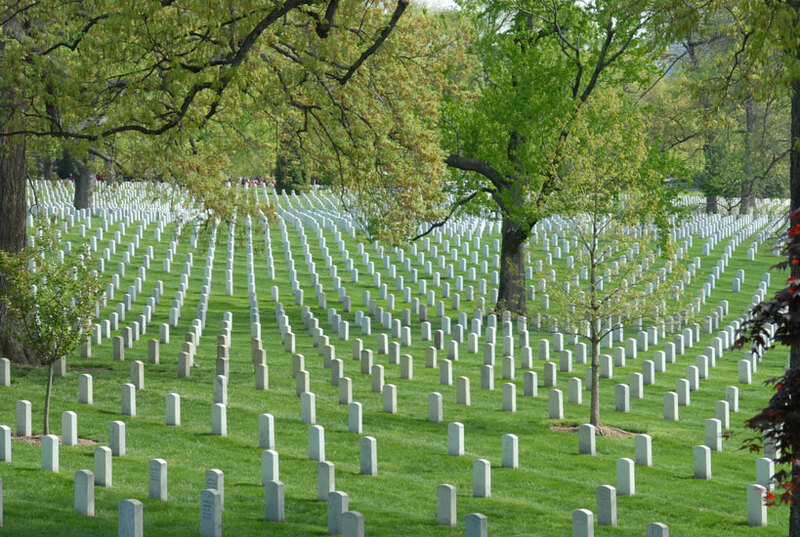 The two cities are bursting of memorials, museums, not to forget, the largest national cemetery: Arlington National Cemetery. To give an idea of the WW2 memories you can find in this area, we made this report. For a complete overview of the many locations, you can click on the map above or use the search bar and search on: "Washington" or "Arlington". The sites described below are accessible by foot or with very well controlled public transport. The underground network of Washington runs into Arlington, Arlington cemetery even has its own metro station. We start our route in "the nation's capital". 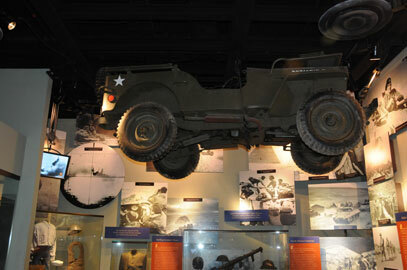 The capital of America has a number of fine museums and war memorials. Most of these are within walking distance of each other. What stands out in almost all the museums is that they are set up with a lot of investment money, everything is high quality, especially the used construction materials. 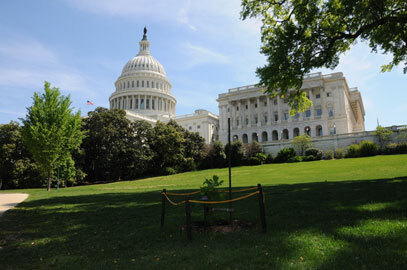 The museums in Washington are also admission free. Besides World War II sites, there are several other sites of other wars such as the American Civil War, World War I, the Vietnam War or the Korean War. 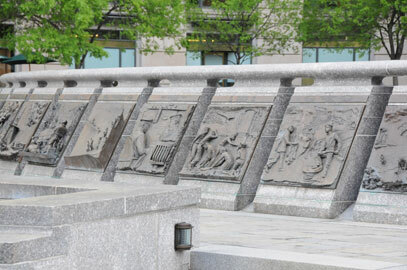 An absolute must-see in Washington is the beautiful World War II Memorial. 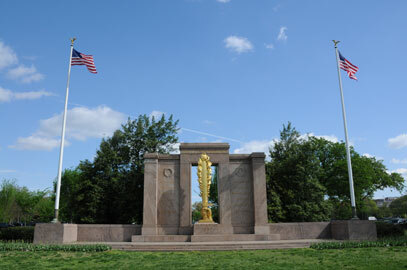 This gigantic monument is located in the park the National Mall, behind the white house. 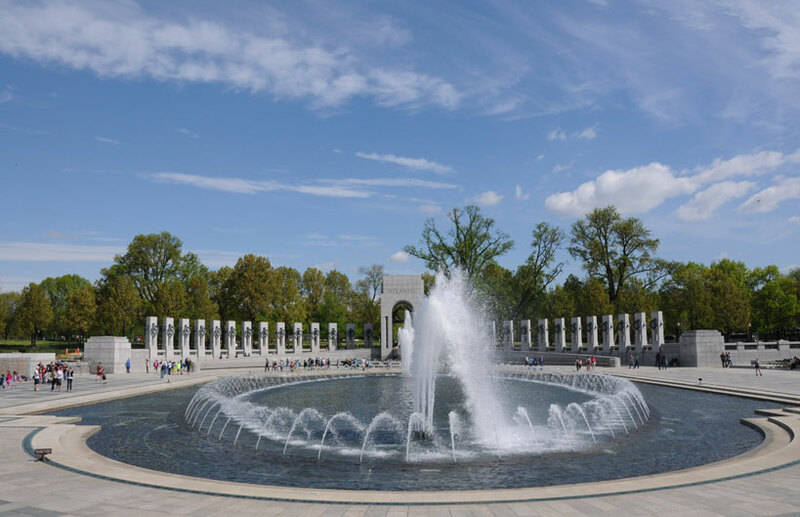 It is beautifully situated at the Reflecting Pool which is adjacent to the impressive Lincoln Memorial on the other side. The impressive monument which was unveiled in 2004, consists of 56 piles of 5 meters high, set up in a circular shape. In its center is a beautiful fountain. 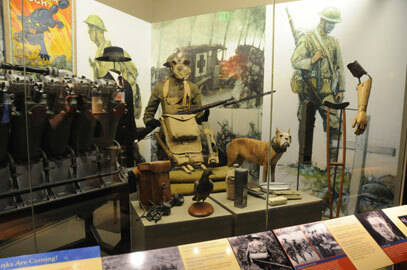 Several World War scenes are displayed and every American state is mentioned. 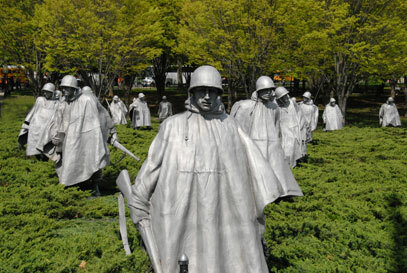 Not far from this monument are the Vietnam Memorial and the beautiful Korea Memorial. They’re obviously not WW2 sights but a visit is well worth your time. 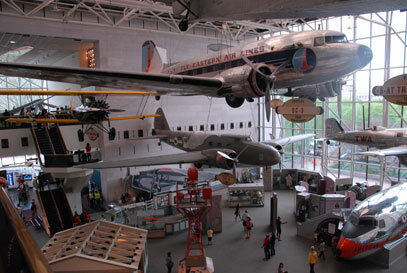 After the World War II Memorial, the Smithsonian National Air and Space Museum is definitely the highest recommended place to visit. This museum contains an extensive collection of WWII aircraft including, a B17 Flying Fortress, B-29 Superfortress (known from the atomic bombing on Hiroshima), B-25 Mitchell, B-24 Liberator, Focke Wulf FW190, P-51 Mustang, a V1 and V2 rocket and much, much more. Besides the many planes there are many other attributes to be admired of the Second World War. 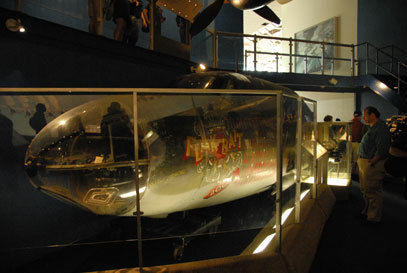 A top piece in the collection is the fuselage of the famous B-26 Marauder "Flak Bait". This bomber holds the record for the number of flown bombing missions during World War II. 202 missions over the Netherlands, Belgium, France and Germany were flown with this aircraft from England operated by the 449th Bombardment Squadron, 322d Bombardment Group. There has also been given attention to the development of strategic bombing and the impact it had on countries such as Germany and Japan. 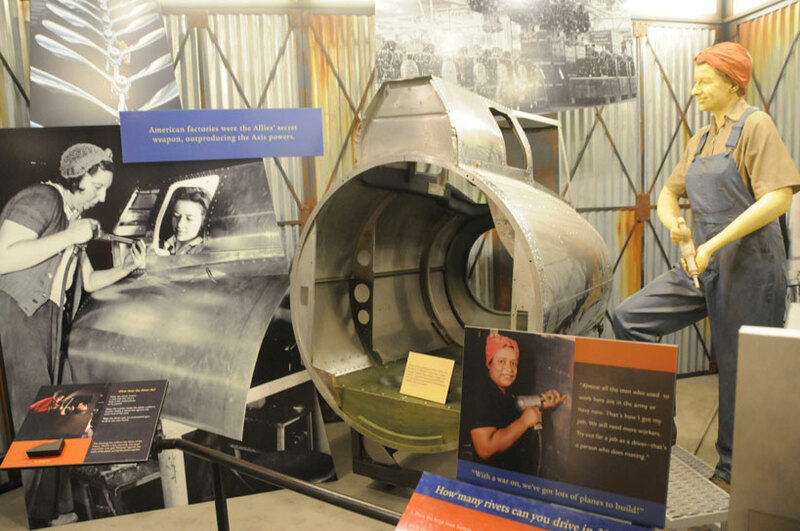 The museum contains much more than just a collection of World War II, particularly the space collection with many space shuttles and NASA attributes is highly recommended. 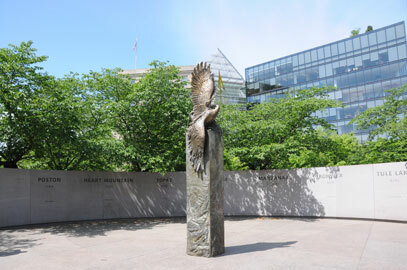 An absolute highlight in terms of museums in Washington, is the Smithsonian National Museum of American History. 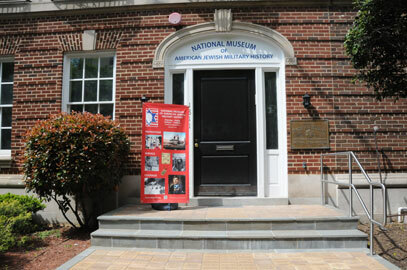 This museum which focuses on the many facets of American history, has a large collection of World War II artifacts and of the many other wars in which America has fought as well. What for a European visitor will certainly be interesting as well, is the exhibition about the Vietnam War, something hardly mentioned in European museums. There is a Hu-1 (Huey) helicopter with a typical Vietnam War scene depicted. Another special part of the collection of this museum is a bent steel column of the carcass of the collapsed World Trade Center. Regarding the Second World War, there's a lot of attention to the women's participation in the war, for instance women who built airplanes. Besides this, they focus on weapons, vehicles and the bombing of Germany and Japan. The museum also pays much attention to another dark chapter in American history, slavery. The collection of this is large and certainly interesting. 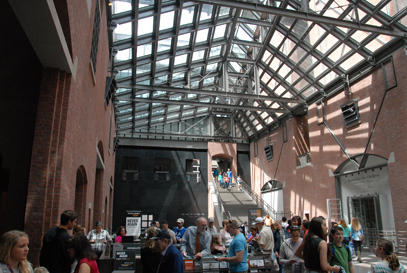 A museum in Washington that attracts a lot of visitors, is the United States Holocaust Memorial Museum. The museum is (as the name implies) more a monument than a museum. 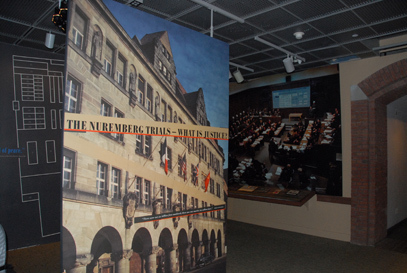 Compared with the museums in Europe, it is not of great significance. However, the attention to the commemoration of the Jewish victims, makes it a commemorative place which is worth a visit. 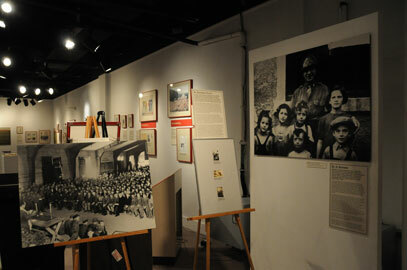 This museum, which is located further to the north, but easily accessible by subway, is worth a visit. Don’t expect an exclusive collection of expensive artifacts in this museum, but who wants to get an impression of what Jewish soldiers have achieved in several wars, have come to the right place. The enthusiastic manager takes the time to inform you about the exhibited attributes and Jewish Medal of Honor receivers from different wars. 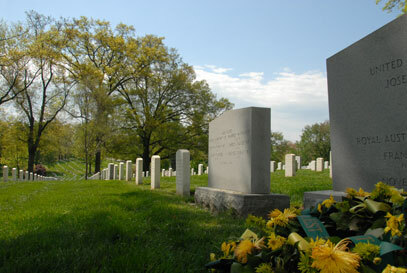 Arlington is best known for the huge national cemetery including the grave of President Kennedy. The Pentagon and Fort Myer are known to many as well. 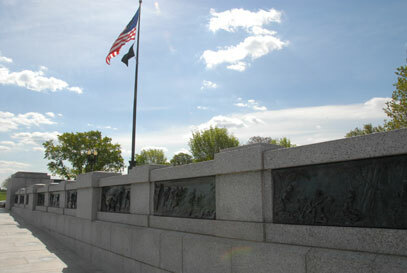 The city is easily accessible from Washington DC by public transportation or by foot over the Arlington Memorial bridge. On the north side of the cemetery, you will find the imposing Iwo Jima Memorial. 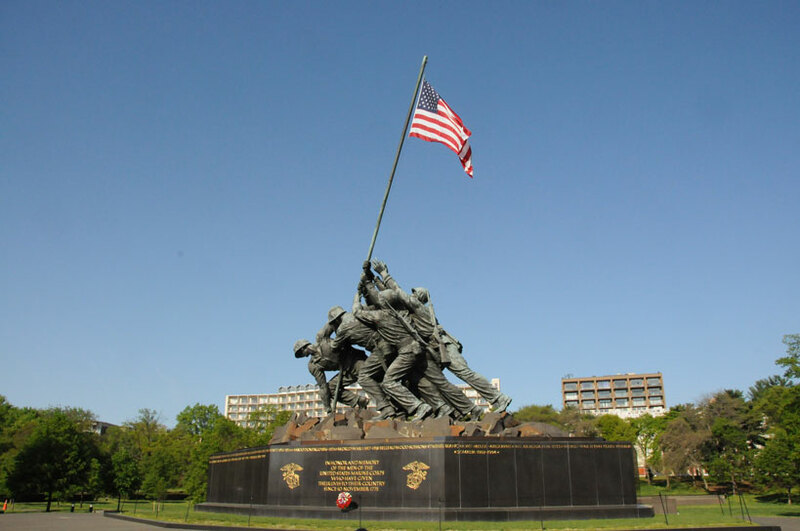 This monument which commemorates the Battle of Iwo Jima, is a must-see in Arlington. It is without doubt the nicest WW2 monument of the city. 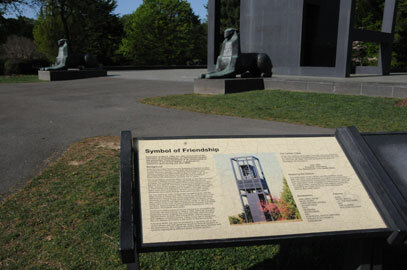 Near the Iwo Jima Memorial and just before the side entrance of Arlington Cemetery, you will find the Dutch Carillon. 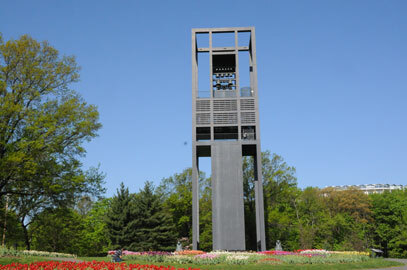 The Dutch Carillon was a gift from the Netherlands to America for the help and support during World War II. The above link to our website tracesofwar.com gives a description of the creation of this monument. A nice detail is the field of Dutch tulips of many different colors in front of the monument. Moreover, the carillon plays many tunes that can be heard over a large part of Arlington Cemetery. The monument is guarded by two large lions, the royal symbol of the Netherlands. 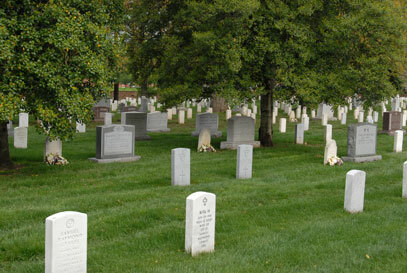 We arrived at Arlington National Cemetery, this national cemetery with approximately 400,000 graves of soldiers, veterans, presidents, astronauts and many American heroes is a huge collection of special tombs and monuments. 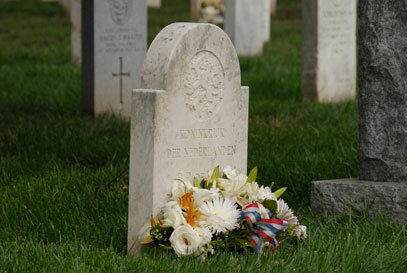 The cemetery dates from the American Civil War, from this war, many graves and monuments can be found. This is the same for all wars between the Civil War and now. But still today new graves are dug for new war victims and many veterans. About the Second World War, a lot of memories can be found, monuments and memorial trees of almost all divisions can be found around the cemetery. It is not allowed to drive over the cemetery by bicycle or car, however, it can be done by foot in a very good way. The paths are good and the routes are varied. No long rows of identical crosses, but a lot of variety in the structure of the cemetery, which makes no punishment to pass 400,000 graves. 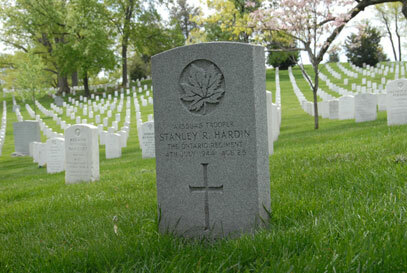 The graves of World War II are scattered throughout the cemetery, like the graves of all other wars. Some American soldiers or airmen who were killed in Europe and were buried in Europe before, were repatriated to this cemetery in the 50’s. 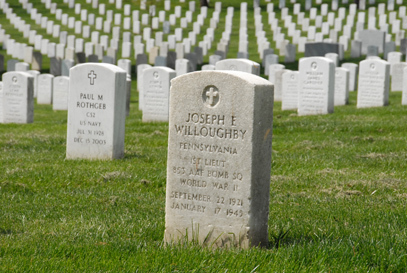 Not only Americans who died in Europe but also Europeans who died in the US are buried here. 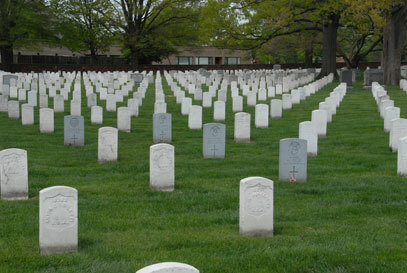 For instance four Dutch soldiers who died in America are buried in this cemetery. The four Dutch War Graves, complete with original tombstone of the Dutch War Graves Foundation lie close together on the back of the cemetery. Besides Dutch, there are a total of 30 Commonwealth War Graves, most British and some Canadians and Australians. 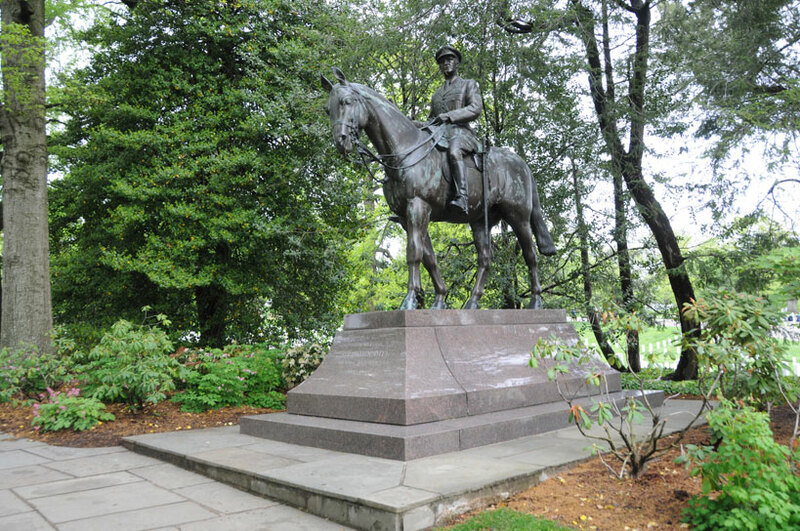 Among these graves, there is one that stand out of the rest, it doesn't have the typical white or gray tombstone of the Commonwealth War Graves Commission like most of them, but it is a horse statue on a marble foot. This is the tomb of Field Marshal John Greer Dill. 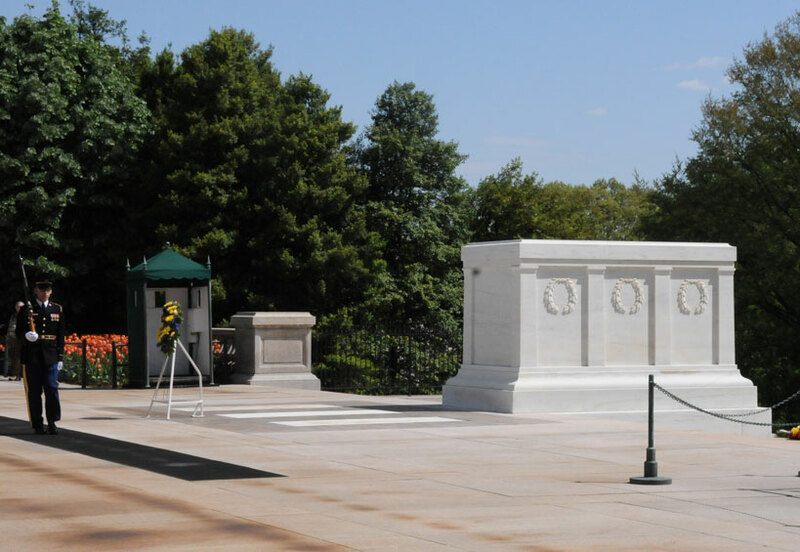 The tomb of the unknown soldier is worth a visit. The four graves, of which one is empty, are from the First- and Second World War and the wars in Korea and Vietnam. The last tomb is empty, the unknown victim of the Vietnam War, named Michael Blassie was identified and reburied in another cemetery. The tomb is constantly guarded by a guard. The changing of these guards is a ceremony of weapon arts and other movements. After this ceremony, the weapon handed over to the new guard. Besides the sites we mentioned, there are many other monuments and special graves in this cemetery. Due to the fact there is too much to display in this report, we didn’t include it all. Are you still interested? Then search for "Arlington" in the search bar of tracesofwar.com or search for destinations on the map above.